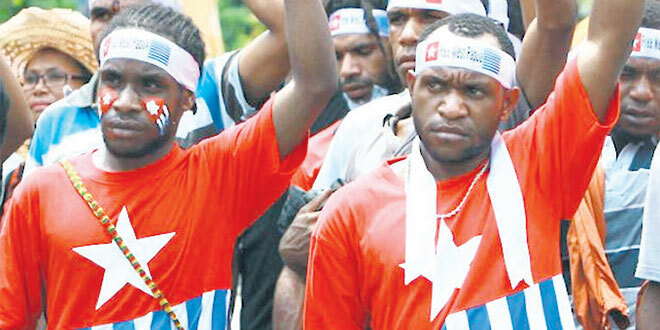 Standing tall: Recent pro-independence demonstrators in West Papua. On May 2, about 1500 people were arrested in Jayapura at a protest. WITH Australia heading to a general election, Catholic Church leaders are calling on the major political parties to end their double standards on human rights advocacy in the region. Brisbane archdiocese’s Catholic Justice and Peace Commission executive officer Peter Arndt said successive Australian governments had ignored human rights abuses by Indonesian security forces in West Papua while condemning similar abuses elsewhere in the region. Mr Arndt said despite the advocacy efforts of the commission, Australian politicians from both sides were mute on human rights issues in Indonesia’s most easterly Papuan provinces, collectively known as West Papua. “Yes it is the case, both the former Labor governments and the current Coalition Government do not want to speak out loudly about West Papua,” he said. “I can recall recently Foreign Minister Julie Bishop commenting about the Papua New Guinea police shooting into a crowd of student demonstrators in Port Moresby, expressing their concern for the lack of respect for the basic human right to express their political views freely and peacefully, but we don’t hear Julie Bishop, or her counterpart in the Opposition, expressing concerns publicly about the same sort of behaviour and more in West Papua. In March, The Catholic Leader reported on alleged cases of human rights abuse cited by a Church fact-finding mission led by Mr Arndt and human rights advocate Josephite Sister Susan Connelly. The mission documented recent military and police intimidation, beatings and torture, kidnapping and murder in West Papua. Sr Connelly, likened her visit to West Papua to “stepping back twenty years when I first went to East Timor”. “The same oppressive security presence everywhere, the same suspicion, bewilderment, frustration and sadness,” she said. Mr Arndt said one of the reasons he found it difficult to get any traction with Australian politicians was that international journalists were restricted from entering West Papua to report. A ban on foreign reportage was imposed in 2003, although recently some international outlets have been allowed to send in journalists under tight control. Mr Arndt said the lack of unfettered international reporting on potential human rights abuses was exacerbated by media interference inside West Papua. “Recently, the deputy police commissioner in Jayapura (the capital of Papua Province) complained about one of the local news outlets because its journalists were not co-ordinating with the police in reporting demonstrations by activists,” he said. On May 2, about 1500 people were arrested in Jayapura. It barely rated in Australian media although it was the largest mass arrest of pro-independence demonstrators in Papua, and included arrests in regional centres Sorong, Merauke, Wamena, Fak-Fak and Manokwari.